The Forensic Hospital implemented measures to improve the quality and compliance of patient outcome measures collected, including staff education and data feedback sessions, a user-friendly glossary and the development of a program to facilitate the analysis of Health of the Nation Outcome Surveys (HoNOS) and other outcome measures. To improve compliance with the collection of HoNOS, from 78% to over 90% by June 2017. Improves the quality and compliance of patient outcome data collection. Ensures patient outcome data reflects the complexity and needs of patients. Ensures adequate funding is received to meet the needs of patients. Increases clinical engagement and accountability in the use of outcomes measures in patient care. Prepares the facility for the implementation of Activity Based Funding (ABF) and the Australian Mental Health Care Classification (AHMCC). Increases collaboration with interstate forensic mental health inpatient services. Enhances staff understanding and clinical use of patient outcome measures. In 2014-15, Justice Health & Forensic Mental Health Network (JH&FMHN) participated in a national Mental Health Costing Study. From this study, the Independent Hospital Pricing Authority (IHPA) developed the first version of the AMHCC which will be introduced on 1 July 2017. It is a comprehensive classification system that will allow accurate data to be collected on all mental health services in Australia, to address service gaps and improve service delivery. All states and territories in Australia are required to collect mental health outcome measures under the National Outcomes Casemix Classification (NOCC). These measures monitor changes in the patient’s clinical presentation. HoNOS is the measure that IHPA has chosen to include in the AMHCC. This means that HoNOS will be used to classify and fund mental health services. It is therefore imperative that each service maintain high standards of quality and compliance with HoNOS collection, to accurately reflect the needs of the patients and ensure adequate funding is received to meet these needs. Prior to this project, there was limited clinician and patient understanding and clinical use of these outcome measures. This highlighted a need to lift the profile of outcome measures, improve transparency and increase patient participation. To prepare JH&FMHN for the implementation of the AMHCC and improve clinician and patient engagement, the following objectives were developed. To improve the quality and compliance of patient outcome measures collected, in preparation for the implementation of the AMHCC. To identify alternative outcome measures that better reflect forensic mental health patient needs, for future versions of the AMHCC. To integrate the collection and clinical use of patient outcome measures in the JH&FMHN, to support the implementation of ABF. An audit was conducted between May and June 2016, to collect baseline data on the compliance and quality of mental health outcome measures across the Forensic Hospital. 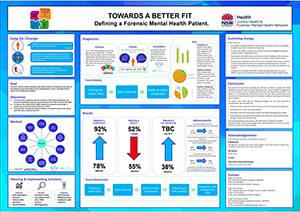 Baseline data was presented to stakeholder focus groups during June and July 2016 using root cause analysis, staff and patient surveys, and individual staff interviews. Feedback identified key issues and solutions on compliance, quality and clinical use of data. Consultations were held with forensic mental health providers in Victoria and Queensland to discover additional solutions for the project. A literature review was undertaken to identify outcome measures specific to forensic mental health. Consultation with IHPA was undertaken, to discuss the use of outcome measures specific to forensic mental health. The team participated in the NSW Activity Based Funding Taskforce AMHCC Readiness Project, to ensure the Forensic Hospital was able to implement AHMCC successfully. Based on feedback from focus groups, a simplified and user-friendly glossary for outcome measures was developed and distributed to nurses across the Forensic Hospital. Mental health outcome measures were added to the Forensic Hospital orientation, to provide staff with access to the database and help them understand the importance of data collection. Ongoing education sessions were added to the learning and development calendar, to support staff and sustain improvements. An application was developed using the Visual Basic for Applications program, to facilitate the analysis of HoNOS and other outcome measures, as well as automate the production and timely delivery of reports to clinicians. Data feedback sessions to managers and clinicians were implemented in each unit of the Forensic Hospital. Regular meetings were held with the Together for Recovery team, to identify opportunities for patient and carer participation. integrate solutions into an Activity Based Management framework. An evaluation of the ‘improve’ phase will be undertaken in June 2017, measuring compliance with the collection of HoNOS. As of February 2017, the following results have been achieved in the ‘improve’ phase of the project. Compliance with the collection of NOCC inpatient measures increased from 78% in 2016 to 85% in 2017 (NSW average is 70%). The quality of HoNOS ratings improved from 16% in 2015 to 5% in 2016, with 0 scores. A score of 0 implies there are currently no clinically significant issues. Patient participation in K-10 increased from 50% in 2015 to 62% in 2016. K-10 is a survey completed by patients that measures levels of psychological distress. It’s important to have stable sponsors who can promote and facilitate the project. To improve data compliance and quality, you need to provide ongoing feedback to clinicians. It’s important to maintain progress despite competing priorities. Gibbons L, McCarthy L. Payment by results in forensic mental health. British Journal of Psychiatry 2015; 39(5): 209-212. Shinkfield G, Ogloff J. Comparison of HoNOS and HoNOS-Secure in a forensic mental health hospital. The Journal of Forensic Psychiatry and Psychology 2016; 27(6): 867-885. Segal A, Daffern M, Thomas S et al. Needs and risks of patients in a state-wide inpatient forensic mental health population. International Journal of Mental Health Nursing 2010; 19: 223-230. Shinkfield G, Ogloff J. A review and analysis of routine outcome measures for forensic mental health services. International Journal of Forensic Mental Health 2014; 13: 252-271. Shinkfield G, Ogloff J. Use and interpretation of routine outcome measures in forensic mental health. International Journal of Mental Health Nursing 2014; 25: 1-8.